When you're viewing the issues, activity, or reports dashboard, you can filter results with our default popular filters. While our popular filters should solve most of your needs, you may want something more customized. This is where custom filters comes into play. You can create a custom filter by clicking on the Viewing: [Filter] label when you're on the dashboard section of DoneDone. You can create a custom filter both on the global dashboard ("All Projects") or a single project dashboard. Just click on the Create a New Custom Filter button. On the Custom Filter creation screen, fill in how you'd like to filter your issues. 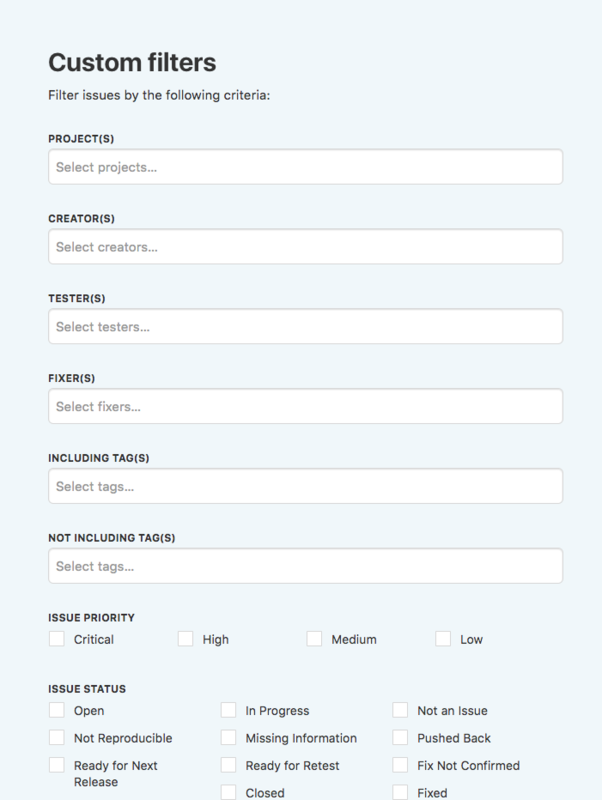 You can filter by projects (unless you are creating a project-specific custom filter), creators, testers, fixers, included tags, not included tags, priority, status, and when issues were updated or created. Our filters query across each filter type with an "AND" operator and within each filter type with an "OR" operator. In other words, if you created a filter where the testers include John Doe, Jane Smith, and Mary Johnson and the fixers include Mike Jones, James Evans, and Martha Davis, DoneDone will find all issues where the tester is John OR Jane OR Mary AND the fixer is Mike OR James OR Martha. At the bottom of the page, give your custom filter a name and then click Save Filter. Your custom filter results will now load and will always be available by clicking on the Viewing: [Filter] label. You can also edit or delete custom filters after you've created them.